Credit: The Gebel el Silsila Project 2016. In the last two years, archaeologists have made quite a few fascinating discoveries over at Gebel el Silsila (also known as Kheny or ‘Rowing Place’ in Egyptian), the famed ancient sandstone quarries of Egypt, north of Aswan. These findings entailed: stone carvings of an Egyptian pharaoh (who was depicted making offerings two major Egyptian gods Amun-Ra and Thoth) and a four-storied temple (with 6,900 sq ft foundation area). Simply put, the discoveries pretty much alluded to the plausible scenario that Kheny was not just a stone quarry site, but also a proper settlement with its own set of religious structures. And now the hypothesis can be strengthened into a fact, with the recent excavation of an entire necropolis at this Egyptian quarry site that dates from 3,400 years ago. Contemporary to the New Kingdom period, the necropolis was surveyed and found to have over 40 tombs, while being flanked by small shrine by the banks of Nile. 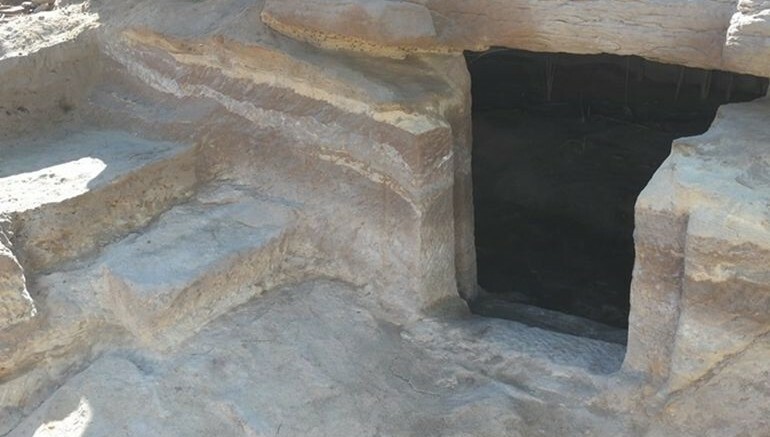 Unfortunately, as noted by Lund University researchers (the same researchers who made the initial discovery of the Pharaoh carving in 2014), many of these burial compartments are dilapidated due to effects of heavy erosion and decay brought on by the rising levels and high salt-content of the Nile water. Now structurally, the necropolis was (conventionally) situated at a below-ground level with its main access being furnished from a series of steps that led to roughly-planned square chamber. Suffice it to say, the tomb entrances open to this courtyard-like chamber, while also comprising square apertures that have vertical slots to either door – possibly for vertically arranged lids. As for the aforementioned shrine, the rock-cut structure has a pair of open-chambers that look out to the river, along with an interior doorway that proudly showcases the winged solar disc. Now it should be noted that while Gebel el Silsila was a thriving economic site (especially given its importance as a stone quarry) most of the higher-ranked officials stationed here were buried at Thebes. So the necropolis in Kheny probably catered to people who were slightly down the social ladder. The unadorned nature of the tombs pretty much mirrored such an economic status. However, on the other hand, the researchers are also quite sure that the occupants were more like middle-class, as opposed to poor laborers and workers. This is evident from finds such as fragments of painted mud-plaster (that were possibly used for decorative coffins), along with mummy wrappings and objects like beads and amulets. Preliminary analysis of the bones suggests burials of men, women and children of all ages. Importantly, this indicates a more permanent habitation at Gebel el Silsila than previously thought.